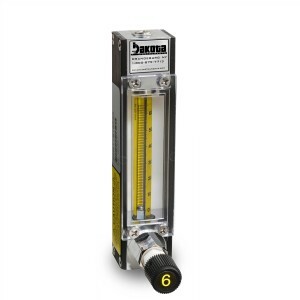 Designed for low flow rates, these 65mm Single Tube Brass Flow Meters are precision instruments embodying the inherent simplicity, versatility and economy of the classical variable area meter. They are particularly suitable for metering carrier gases in chromatography, in manufacturing processes, liquid and gas measurements in laboratories, pilot plants, flow and level indicating and controlling gases. No Valve. Designed for low flow rates, these 65mm Single Tube Brass Flow Meters are precision instruments embodying the inherent simplicity, versatility and economy of the classical variable area meter. They are particularly suitable for metering carrier gases in chromatography, in manufacturing processes, liquid and gas measurements in laboratories, pilot plants, flow and level indicating and controlling gases. This rotameter comes with a CV Valve. CV Valves are designed for adjusting flow rates in applications where high resolution metering regulation is not essential. Designed for low flow rates, these 65mm Single Tube Brass Flow Meters are precision instruments embodying the inherent simplicity, versatility and economy of the classical variable area meter. They are particularly suitable for metering carrier gases in chromatography, in manufacturing processes, liquid and gas measurements in laboratories, pilot plants, flow and level indicating and controlling gases. This rotameter comes with a High Precision MFV Metering Valve. MFV Valves are ideal for adjusting flow rates whenever high sensitivity control and resolution are desirable, particularly in conjunction with metering tubes of very low flow rates. 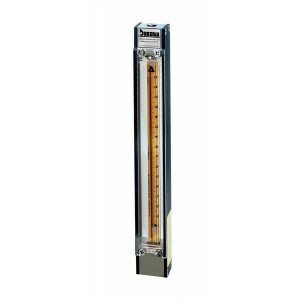 Designed for low flow rates, these 150mm Single Tube Brass Flow Meters are precision instruments embodying the inherent simplicity, versatility and economy of the classical variable area meter. They are particularly suitable for metering carrier gases in chromatography, in manufacturing processes, liquid and gas measurements in laboratories, pilot plants, flow and level indicating and controlling gases. No Valve. 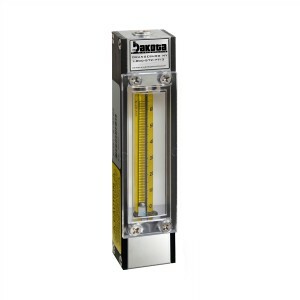 Designed for low flow rates, these 150mm Single Tube Brass Flow Meters are precision instruments embodying the inherent simplicity, versatility and economy of the classical variable area meter. They are particularly suitable for metering carrier gases in chromatography, in manufacturing processes, liquid and gas measurements in laboratories, pilot plants, flow and level indicating and controlling gases. This rotameter comes with a CV Valve. CV Valves are designed for adjusting flow rates in applications where high resolution metering regulation is not essential. 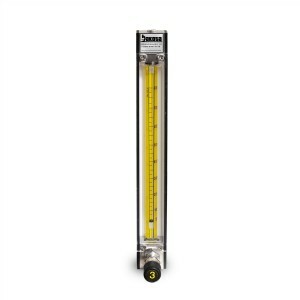 Designed for low flow rates, these 150mm Single Tube Brass Flow Meters are precision instruments embodying the inherent simplicity, versatility and economy of the classical variable area meter. They are particularly suitable for metering carrier gases in chromatography, in manufacturing processes, liquid and gas measurements in laboratories, pilot plants, flow and level indicating and controlling gases. 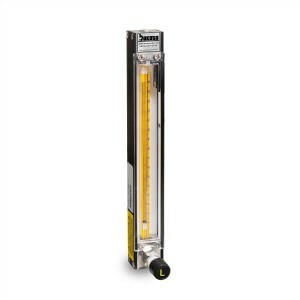 This rotameter comes with a High Precision MFV Metering Valve. MFV Valves are ideal for adjusting flow rates whenever high sensitivity control and resolution are desirable, particularly in conjunction with metering tubes of very low flow rates.